River Ridge girls’ basketball coach Caron Townsend picked up her 500th career victory last Thursday night. POSTED December 27, 2018 11:28 a.m.
SHULLSBURG – With a 57-34 victory over host Shullsburg last Thursday night, the River Ridge varsity girls’ basketball team improved to 4-0 in Six Rivers West conference play and 8-1 overall. Even more significantly though, River Ridge coach Caron Townsend picked up her 500th career victory with Thursday night’s win, giving her a 30-year career record of 500-190. Also last Thursday night, Al Guthman of Owen-Withee, became the all-time leading girls’ basketball coach in the state of Wisconsin when his Blackhawks defeated Greenwood, giving him a career record of 700-299. Guthman surpassed Jim Myers of Barneveld, who previously held the top spot with a record of 699-138. Cuba City’s Jeff Pustina sits third on the all-time list with a record of 652-133. 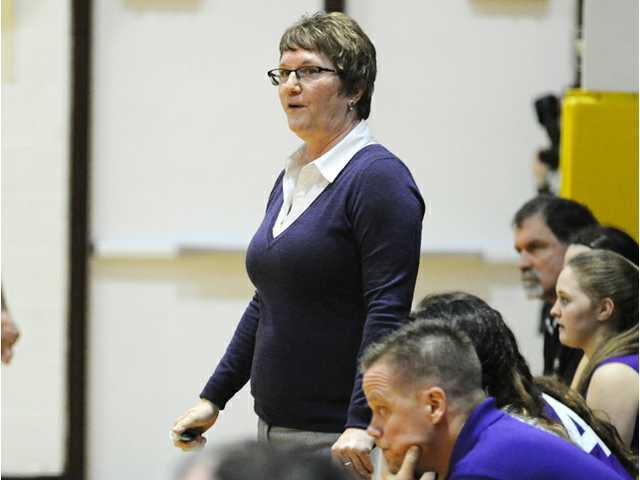 Townsend, who has averaged nearly 17 wins per season during her first 29 seasons, has come back year after year to coach the Timberwolves for a number of reasons. “If you continue to get the parents and kids to believe in your system, that’s why I keep doing it. I keep doing it because the kids are buying into the system,” Townsend added. “I’m going to enjoy it today, and when we get back from break our focus is going to be back on what we started out to do,” Townsend said, which for the Timberwolves is to win a conference championship. Against the host Miners last Thursday night, senior Taylor Langmeier led the Timberwolves with 23 points, while junior Skylar White added 17 and McKenzie Graf seven. The Timberwolves are off until Thursday, Jan. 10, when they travel to Highland. River Ridge - Skylar White 17, Taylor Langmeier 23, Rylee Zinkle 5, Bayli Mason 5, Mckenzie Graf 7. Totals - 23 6-8 57.